To many, the Globally Harmonized System (known as GHS) can seem intimidating. GHS is an internationally agreed-upon system, created by the United Nations in 1992 and was designed to replace the various classification and labeling standards used in different countries. The hope is that GHS will provide a consistent criteria for classification and labeling on a global level and ensure the safe production, transport, handling, use and disposal of hazardous materials. Still confused? We're here to help. Check out our resources below on the GHS guidelines, links to official information from OSHA and advice, tips and articles on how to be compliant. 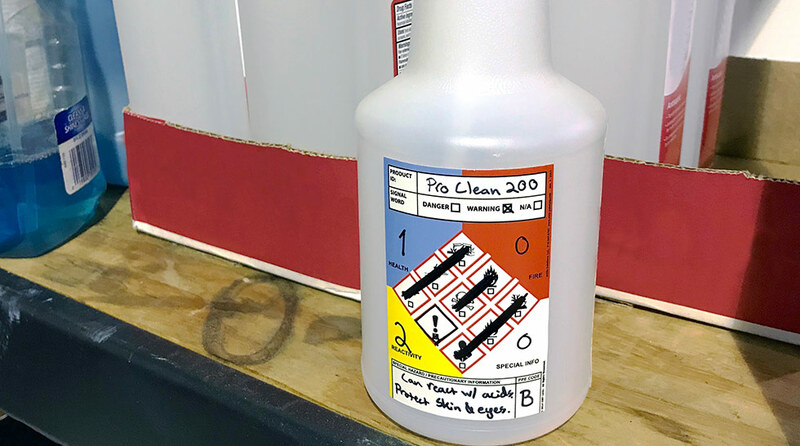 We offer a great GHS label for secondary containers that simplifies the process of migrating your chemicals over to secondary containers a source of fines and citations that's affecting more and more businesses as OSHA begins to check for compliance on GHS issues. Don't get fined! Check out our collection of information on GHS. Our GHS video offers important GHS information, tips and a step-by-step demonstration of how to use our GHS labels. See information on why and how the regulations came to be, why they're important and how you can easily comply with them and avoid unsafe conditions and OSHA fines. Being compliant with GHS regulations for secondary containers doesn't have to be complicated. Get a roll of our professionally designed and compliant GHS labels and you're good to go. It's a simple, easy-to-understand label that is helps employees be safe and informed - and keeps you OSHA compliant. What's the best way to get my chemicals properly labeled?